It is with some sadness that have recently finished a winter camp at Dangsan Elementary School, even despite the fact that I am now on vacation. Winter camp is a requirement for ESL public school teachers in Seoul — the regular school year lets out for winter break at the end of December and SMOE (the Seoul Metropolitan Office of Education, my employer) isn’t going to let us teachers have the entire months of January and February off, so we have to do three weeks of winter camp. As my normal school, Kyeong-in Middle School, had only 8 students sign up for winter camp and our school has two native-language ESL teachers, I was chosen to teach at another school, Dangsan Elementary, which had an SMOE-owned elementary private school (that is, academy). Dangsan is a considerably nicer part of town and this was apparent in the school, which was frankly marvelous. After coming from Kyeong-in, sit-down toilets and free toilet paper in the bathroom was already impressive enough. But they had a fully stocked English library with games, and a craft room full of supplies (including a laminating machine, which I was giddy about) — and a cooking classroom! 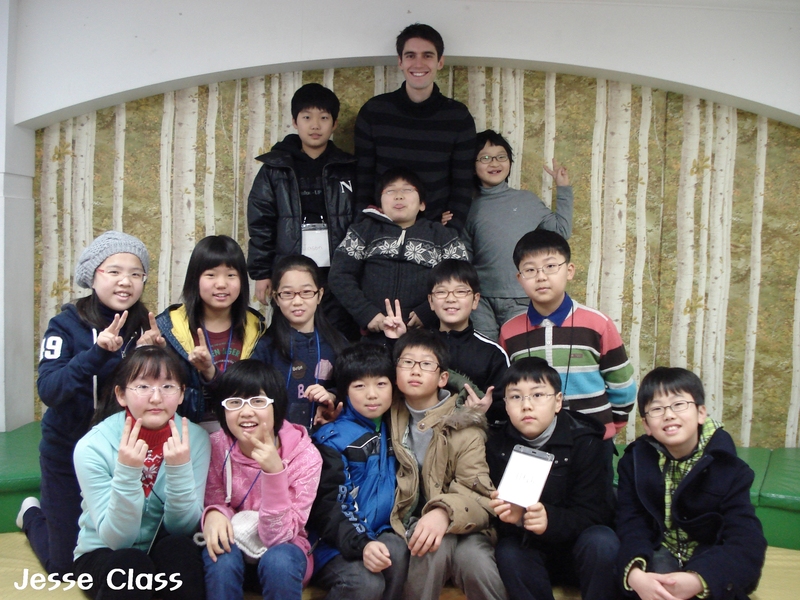 Kyeong-in doesn’t even have a cafeteria — the kids eat in their classrooms! The program was also a huge breath of fresh air. In winter camp, one generally has to prepare more material — instead of having 22 different classes a week, 11 in one grade and 11 in another, there usually only one class during winter camp that you stay with for 3-4 hours each day. So you cannot repeat the material as easily as you can when see each class once a week. Our winter camp had a nice arrangement though — I worked with two other native speaking ESL teachers because our camp was relatively big — 45 students total, 3 classes of 15, instead of the usual one class of 8-15. We were thus able to switch our classes between ourselves and only had to do two unique lessons per day. And since we had a book, lesson planning was a breeze — make up a game or download some worksheets and supplement the book as appropriate. What really made the experience great, though, were the students — especially my homeroom students, who were actually engaged, energetic and interested in learning English. And some of them were really active and super confident, probably partly because of having more exposure to English and parents wealthy enough to send them to good schools like these. Next Tuesday I’ll introduce you to some of my favorite kids (characters, all of them) and give more pictures from the camp!